for Less than one week 50 % of the Total Price . 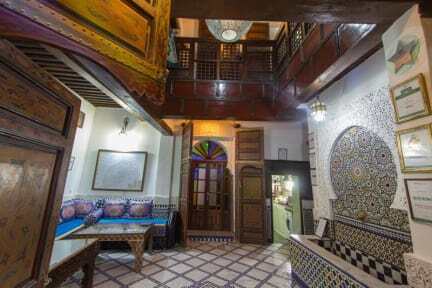 Dar El Yasmine is a beautifully renovated 17th Century home that once belonged to a family of wealthy traders residing in Fez, the ancient intellectual and spiritual capital of Morocco. Restored in the traditional Arabic style with ornate mosaic, marble, plaster, and wood work, Dar El Yasmine is the perfect place to rest your eyes and your feet after exploring the bustling markets and twisting streets of the Old Medina. Join us for tea by the fountain in our inner courtyard, or take in the view of the surrounding hillsides from our rooftop terrace. 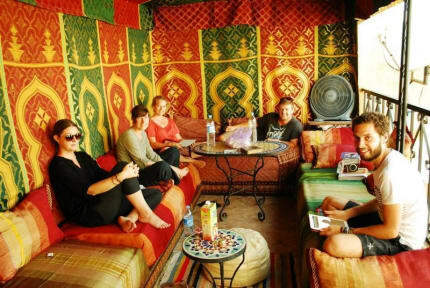 Whether you seek refuge, adventure, or good conversation, Dar El Yasmine is the perfect place to begin your journey! We have private & shared rooms with private bathrooms, hot showers, and air conditioning. Enjoy complementary breakfast in the inner courtyard or on the rooftop terrace. we organize daily desert trips from fes to Marrakech or back to fes ..in addition to Days trips around fes to Meknes /volubilis or middle atlas ,chefchaouen,..and medina tour with offecial Guide .